Spring is here and it will be fun to wear some lovely spring colours in style. Go get some lovely colourful yarn and hooks today we are giving you a curated list of Crochet Crop tops in halter neck style. You can make these for yourself and your friends in different flowery colours. well since there are a lot of these, we have decided to segregate these as Single colour and multi colour ones so that all of us can get an idea as to which one we want to make. RENÉE Crop Top by June Cheung is a lovely pattern made using Sport weight yarn and a 3.75mm crochet hook. All sizes are available. Lex Crop Top by By Hand London made using a bulky weight yarn and a 5.00mm crochet hook. This one is also available in all sizes. 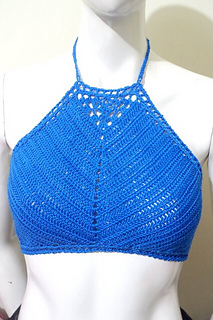 HOPE Crop Top by June Cheung is a beautiful one made using Sport weight yarn and a 3.5m crochet hook. Haveacado’s Crop Top by Ola Gonder is a lovely one can be made using any preferable yarn and hook. Here hook size 3.00mm and 2.5mm is used. the pattern is available e as a Free Ravelry Download. Bea Crop Top by Girlie D. de los Reyes is a lovely one made using thread and a 2.00mm crochet hook. The Amelia Halter Top by Carrie M Chambers is a nice one made using a DK weight yarn and a 3.5mm crochet hook. Racer Back Camisole by DMC is a pretty one made using thread and a 3.00mm crochet hook. Infinite Summer by DROPS design is a beautiful one made using Sport weight yarn and a 2.5mm crochet hook. All sizes are available for this design. Mandarina by DROPS design is a nice one made using DK weight yarn and a 4.00mm crochet hook. All sizes are available for this design. Girlie Crop Top by Girlie D. de los Reyes is a beautiful one made using Worsted weight yarn and a 2.75mm crochet hook. 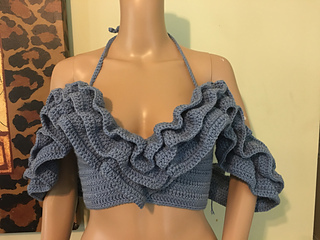 Ruffle Crop Top by Chasing SunRaee Designs is a gorgeous looking top made using Aran weight yarn and a 3.5mm crochet hook. The pattern is available in the form of a Youtube video. 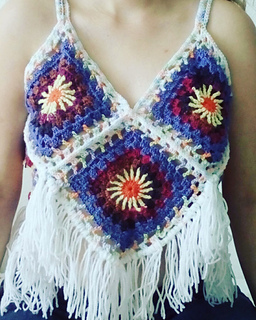 Rheema Halter Top by Girlie D. de los Reyes is a lovely one made using thread and a 3.5mm crochet hook. Lex Crop Top by Wool and the Gang is a beautiful one made using Sport weight yarn and a 5.00mm crochet hook. 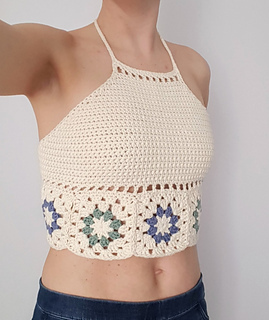 Crop Top by Jane Green is a lovely pattern made using Sport weight yarn and a 3.5mm crochet hook. Extra Small and small sizes are available. You can try to make in different sizes as well. Sunshine Crop Top by Transatlantic Crochet is a lovely one made using a 3.5mm crochet hook. Any yarn and hook can be used. the pattern is available as a Free Ravelry Download. 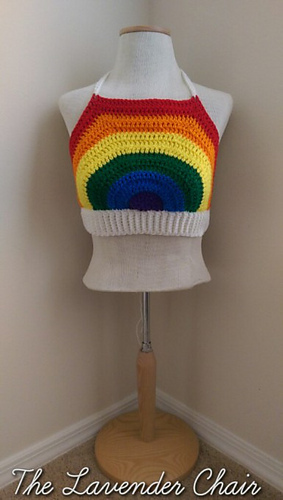 Rainbow Crop Top by Carrie M Chambers is a lovely one made using Worsted weight yarn and a 6.00mm crochet hook. The pattern is available in the form of a Youtube Video. Simple Crop Top by Carrie M Chambers is a lovely one made using Worsted weight yarn and a 5.00mm crochet hook. Rainbow Crop Top by Dorianna Rivelli using worsted weight yarn and Worsted weight yarn, 4.00mm, 5.00mm and a 5.5mm crochet hook. 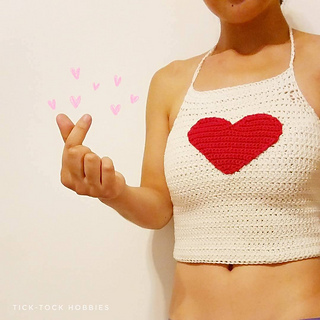 AGAPE Crop Top by June Cheung is a beautiful one with a heart in the middle, made using 1sport weight yarn and a 4.00mm crochet hook. Granny Square Halter Top by Jane Green is a beautiful granny pattern top made using Sport weight yarn and a 3.5mm crochet hook. Hepatica Granny Top by Anna Erlandsson is a lovely one made using Worsted weight yarn and a 3.5mm crochet hook.